Successful and timely diagnostics is directly related not only to doctor’s qualification and experience, but also to the quality and level of diagnostics equipment. The same as a person with health issues looks for a good professional, a diagnostician looks for a modern and good quality device for work. 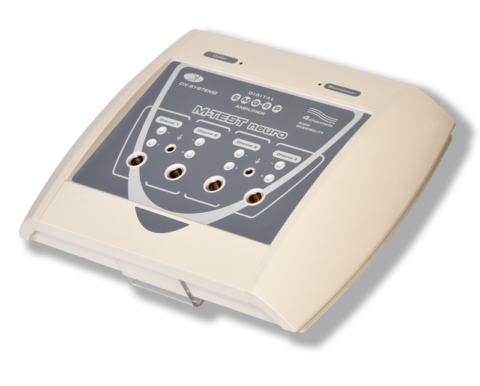 M-TEST electromyography device produced by NVP “DX-Systems” encompasses a wide range of functions, advanced technical characteristics and handiness. This electromyography device will be useful for neurologists, neurophysiologists, neurosurgeons, endocrinologists, rheumatologist and doctors in sports medicine. Quite often, even experienced doctors tend to face certain difficulties when mastering new equipment. With that in mind we created a handy control interface to become doctor’s reliable assistant in no time. Each medical establishment has its distinctive features. The necessity of certain modules, accessories and expendables depends on the tasks, facilities and resources and doctor’s work routine. DX-Systems is ready to spare the customer redundant purchases by ensuring a customized M-TEST set in accordance with customers’ needs. 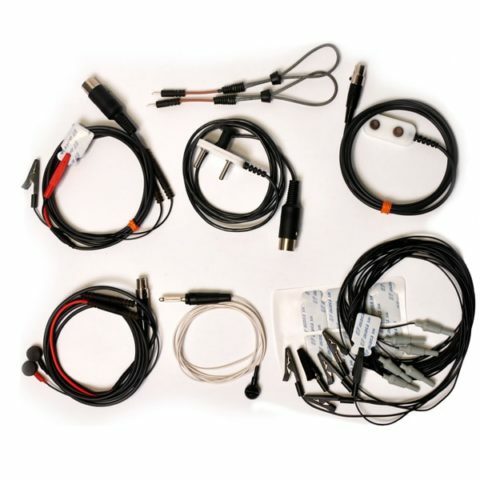 This will add to diagnostician’s comfort and make the process of EMG recording handier, no matter where you work. M-TEST electromyography device is possible to connect to either a PC or a laptop, depending on the make you have. This broadens your diagnostic capacity – in case of a laptop, the mobility of electomyogram recording grows to a great extent. M-TEST has small dimentions and light weight. You can relocate and connect the device on your own (the set contains a detailed instruction manual). 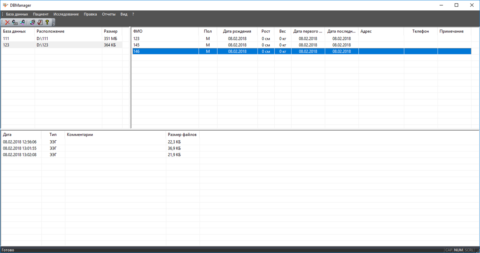 When installing the device, DX-Systems engineer will give you a detailed explanation as to how to connect and use it. Should any questions arise, our trained professionals are ready to provide you with as detailed information as necessary -over the phone, via email or in personal. 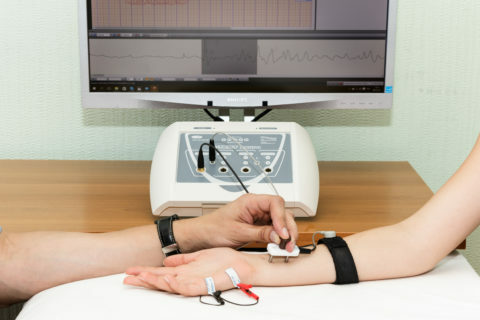 DX-Systems summed up electromyography device requests and for diagnostic purposes is now offering M-TEST in several modifications depending on the number of channels, set of methods and availability of the evoked potentials mode. Which modification suits you best? DX- systems account managers are always happy to help their customers choose the right modification and accessories for their myography systems. Our trained professionals will give you a detailed explanation as to the functions of M-TEST electromyography devices and ask you all the necessary clarifying questions before you decide on M-TEST model that suits you best. Leave your digits, and our account managers will contact you in the soonest possible time. M-TEST computer electromyography device records a 1-, 2- and 4-channel electromyogram. The order and set of methods are doctor’s decision depending on indications for the examination. The database stores patient details, the recorded electromyogram and the results of its analysis. The device is equipped with a full set of functions for a handy and quick work with voluminous electromyogram archives. 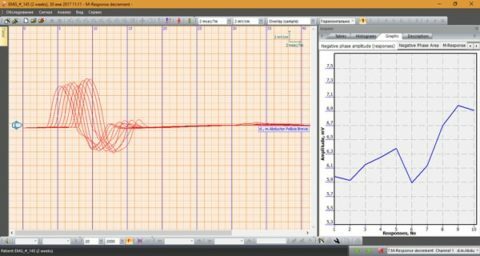 While recording an electromyogram and its review you can customise the amplitude and time scanning and print ot the recorded EMG straight away. The final findings you receive as tables, graphs or diagrams and the final assessment report can be built in the way you prefer. M-TEST electromyograph makes it possible to register a spontaneous muscle activity with two types of surface pickup electrodes: with variable and fixed inter-electrode distance. 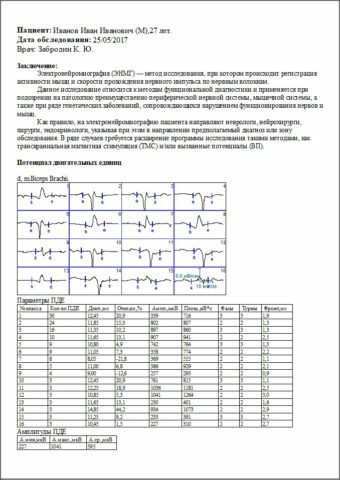 The system identifies key parameters for intereferential EMG: whole muscle electrical activity and peak and mean signal amplitudes. For orthopedic dentistry a chewing test is envisaged additionally. Muscle voluntary actions in patients with chronic headache can be looked into by means of exteroceptive suppression function. M-TEST registers muscle evoked response obtained through stimulation electrodes during electric peripheral nerve stimulation. 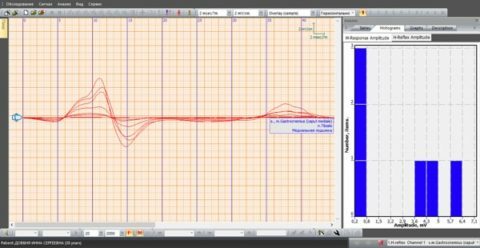 When analysed М-Response is looked into along the following characteristics: generation threshold, latency time and amplitudes, durations and areas, residual latency and impulse conduction velocity and values shift. M-TEST makes it possible to expolre nerve action potential where sensory conduction velocity (NCV) is measured. When exploring delayed responses F-wave is analysed (latency, motor conduction velocity, chrono dispersion, tacheodispersion, mean velocity, F-wave amplitude and F/M ratio) and H-reflex parameters are evaluated under the single and paired stimuli approach (latency, amplitude, H-reflex threshold and H/M ratio shift). 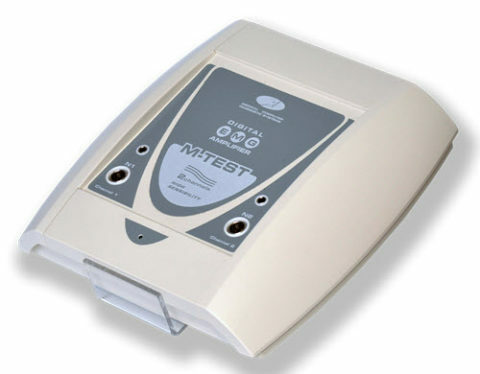 M-TEST enables the user to record a rhythmic EMG (including M-response decrement) and carry out pharmacologic and stress testing, including tetanization and post-tetanization phenomena analysis to specify the character of neuromuscular transmission defect. To explore the state of relex arches conduction systems M-TEST is equipped with the function of blink reflex testing. Muscle spontaneous activity is analysed, motor unit potentials are singled out and explored. Durations, amplitudes and areas are measured. Band voicing is envisaged for EMG auditory assessment. The device is equipped with needle EMG turns-amplitude analysis. When developing M-TEST, we put much effort into making databases easy to handle. Patient data, recorded electromyograms and EMG findings are stored on the PC. You will have access to a full range of functions for comfortable work with electronic patient card index and voluminous archives you are going to accumulate over years of operating our electromyograph. To spare you wasting your presious time on drawing reports, we developed the “Assessment Report Wizzard” mode. It is used to put together your final findings. Examination results may be handed out as a hard copy, sent via email or a local network. An option of all EMG data export to share the findings with colleagues for the sake of practice and research. When working on the functionality of our devices we are constantly in touch with neurophysiology practicioners for their feedback, because we strive for creating a modern and handy multifunctional device. 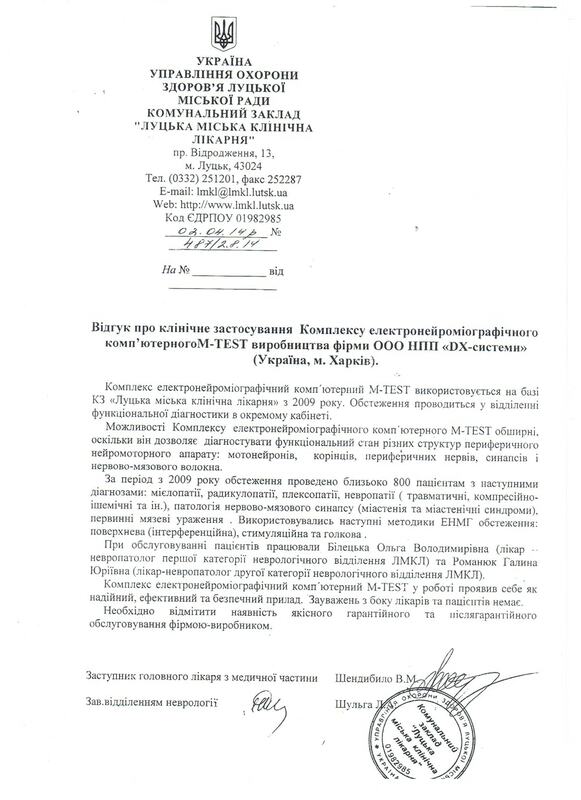 In the first place it concerns M-TEST electromyography software. To make sure M-Test is what you need, get M-TEST demo. We are trying to provide our customers with as much information as possible and, therefore, ensuring free access to M-TEST demo. 1Leave your email address, where we will send the link. 2After clicking "Get Access" you will receive an email message within an hour. 1. We are ready to provide you with advice on any question you have regarding the work of our medical equipment. 2. We do device servicing. 3. We organise calibration upon customer’s first demand. 4. We take on responsibility for ensuring you with software updates. 5. We provide you with all the necessary expedables. 1. We will do our best to ensure remote assistance: over the phone, via email or Skype or by using TeamViewer. 2. If remote assistance does not solve the problem, we send out our technician to look into the issue on-site. 3. If the device needs to be transported to our service centre for servicing, we provide you with a substitute device for the whole period. DX-Systems has developed three generations of M-TEST electromyography devices and installed those devices in dozens of clinics, being in constant touch with the doctors, which are operating them. We are on good terms with all our customers and for each of them we have a permanent offer. If you have been using M-TEST electromyography device already, you are ensured with a personal considerable discount on the new models of this series. 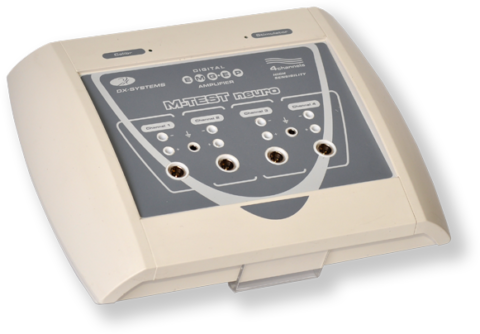 If you are considering becoming our customer, we will ensure you with the discount on all the electromyography models you buy after your first purchase. Operate our M-TEST electromyography device during a 15-day free trial! 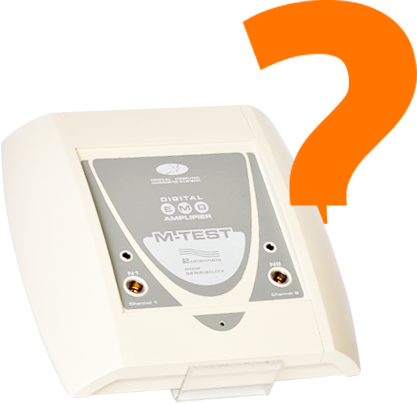 If you are still in doubt as to purchasing M-Test electromyography device, we are offering you to try how it works. You use the device for 15 days and then decide if you want to buy it. If you decide against purchasing M-Test, we will be grateful for your feedback. 1Send a request and we will contact you to discuss the details. 2The device will be delivered, installed and you will be given detailed instructions on how to use it. 3You will have 15 days to get familiar with the device. 4You will be able to make a responsible decision on whether to buy M-TEST or not. If you are accepting our offer, you may leave your digits and our account manager will telephone you and assist in filling in the trial request. M-TEST Electroneuromyography Computer Complex has been used in Lutsk Municipal Hospital since 2009. The examinations take place in a specialized room for functional diagnostics. 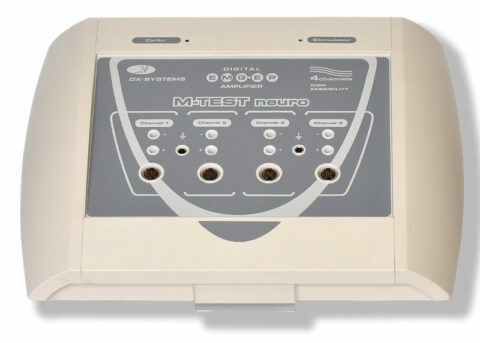 M-TEST electromyography computer Complex has a wide range of functions, since it ensures functional state diagnostics of different structures in peripheral neuromotor apparatus: motoк units, roots, peripheral nerves, synapses and myoneural junction. 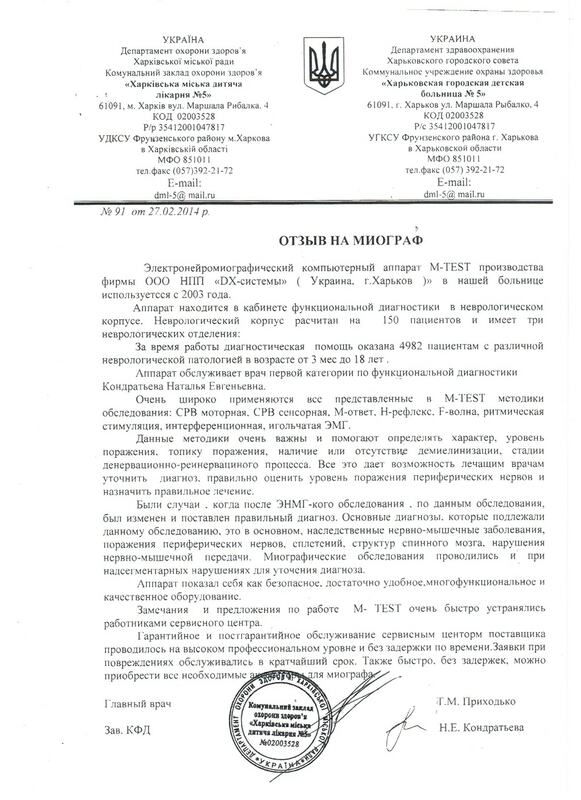 About 800 patients have been examined since 2009 року with the fillowing diagnoses: myelopathy, radiculopathy, plexopathy, neuropathy (traumatic, compression, ischemiс, etc), myoneural synapse pathology (myasthenia and myasthenic syndromes) and primary muscle lesions. The following electroneuromyography methods were used: surface (interferential) stimulation and needle EMG. The patients were examined by Olha Biletska (first category neuropathologist for the Neurology Department of Lutsk Municipal Hospital) and Halyna Romaniuk (second category neuropathologist for the Neurology Department of Lutsk Municipal Hospital). М-ТЕSТ has proved to be reliable, effective and safe to use device. There have been no critisisms either from doctors’ or from patients’ side. Warranty and postwarranty support provided by DX-Systems was on a good level. 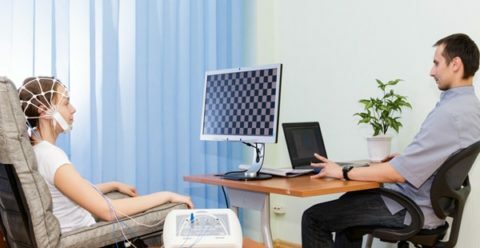 М-ТEST electromyography device is used for examining and dagnostics of nervous system pathologies in children-patients of Kropyvnytskyi Oblast Children’s Hospital. 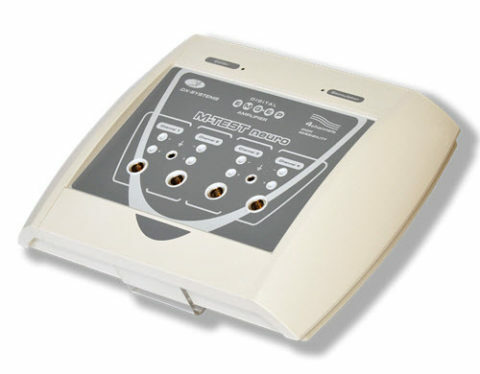 M-TEST is a modern electromyography device, using wide range of computer technologies. In the first place it refers to an opportunity to register an electromyogram of a high quality, store and analyse it, receive an automatic description of its parameters, which simplifies and accelerates doctor’s work. 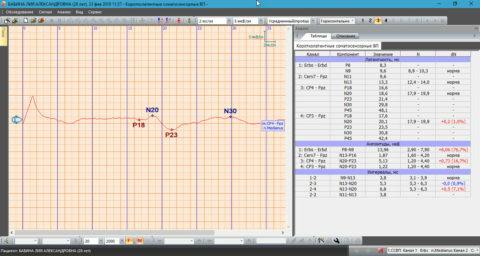 М-ТEST has proved to be handy: it ensures easy and intuitive control in selecting the modes and examination results. 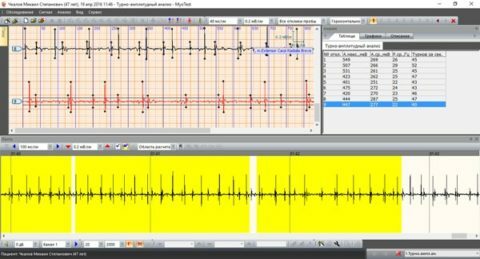 A wide range of tools for analysing a registered electromyogram is a welcome development. 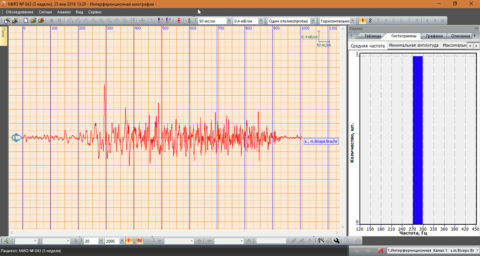 Another benefit is received responses real-time review and analysis function during EMG recording. Thanks to handy way of information storing in a database, M-TEST is helpful when it comes to doctor’s objective assessment of EMG cahnges shift. In our opinion, the process of building the final medical assisstance report needs to be improved. 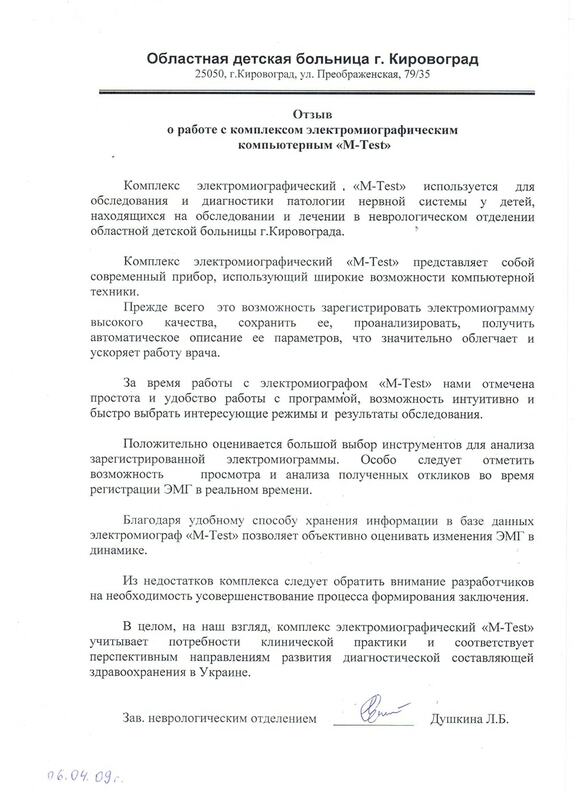 On the whole, M-TEST electromyography device meets the demands of clinical practice and corresponds the perspective trends of diagnostics development in the Healthcare system of Ukraine. M-TEST electroneuromyography device, produced by DX-Systems (Kharkiv, Ukraine) has been used in our hospital since 2003. The device is installed in the functional diagnostics room of the neurology block. Neurology block capacity is 150 patients and has three neurology departments. By using M-TEST 4982 patients with various neurological pathologies aged between 3 months and 18 years have been examined so far. The device has been operated by Nataliia Kondratieva – first category functional diagnostics doctor. 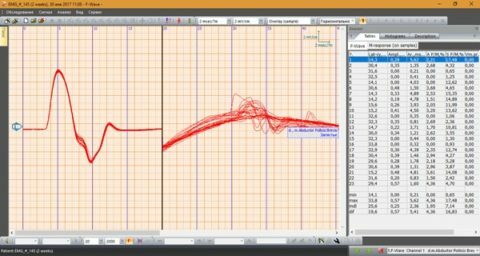 All M-TEST methods have been widely used: motor NCV, sensory NCV , М-Response, Н-Reflex, F-Wave, rhythmic stimulation and interferential needle EMG. Such methods are extremely important and help identify the nature, level and area of lesion, demyelination and denervation-reinnervation process stages. All this enables the doctor to clarify diagnosis, give the right assessment to the level of peripheral nerves involvement and assign adequate therapy. There were cases when due to an EMG examination a previously established diagnosis was changed for a new one. In most cases the diagnoses that required an EMG examination concerned hereditary neuromuscular diseases, peripheral nerves and junctions disorders, spinal structures and neuromuscular transmission failure. Myography examinations were also conducted for amalysis clarification in patients with suprasegmental disorders. The device has proved to be safe to use, quite handy, multifunctional and of good quality. The critisisms and remarks were promtly addressed by customer service. Warranty and postwarranty service was done in a timely manner and on a high professional level by a service centre assigned by the manufacturer. Service orders were addressed in as short period as possible. Also, all the necessary myograph accessories are always quick to buy. Ready to discuss M-TEST purchasing? 1Leave your digits and we will contact you to give you device details, tell you about its performance, explain abour warranty support and purchase conditions.